The political action of the great forces, France, England and Russia, in the area of the Ottoman Empire, resulted in the principality of Samos. Samos became an autonomous small state, subject to the sultan. The prince was Christian, a higher official of the Sublime Porte, and was appointed by the sultan. He governed the island in cooperation with a four-membered local government, which was called the Parliament and was elected by the General Assembly of the proxies of every town or village. 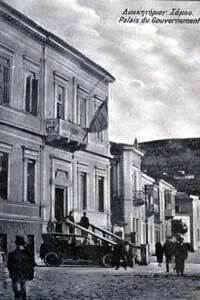 The principality lasted until 1912, when, after a revolution, Samos declared its union with Greece. The 1912 revolution was not the only one against authority. There had been other revolts and protests before, due to various causes and on various pretexts, related mainly to the violation of privileges or to the oppressive exertion of authority. The first period of the principality government, until 1849, was the cruelest one for Samos. The real leaders and the most dynamic part of the population had migrated and been ruled out of the social life of their homeland. The administration of Stephanos Vogorides, the first prince, focused basically on tax-gathering, from people that were already experiencing an economic crisis. Such mistakes resulted in the revolt of 1849, which defined better the privileges and the terms of the autonomy. In 1851, when George Konemenos arrived at the island as the principality's deputy, the autonomous status was established. The small state's services and the courts of law were organized, schools were built in all villages, as well as a printing-office, basic laws were voted and the piracy was wiped out. In 1855, John Ghikas being the prince, the Pythagorion Secondary School started working as a higher educational establishment, and soon after as a higher girls' school. Great teachers from all over Greece were called and scholarships were given to those able to study. Many young graduates continued their studies in Greece, Constantinople or abroad. Finishing their studies, they returned to Samos and by participating in the social and political affairs, they forged the new cultural and political forces of the place. Their influence on the Samian society was soon made evident. Samos developed more and more in the last quarter of the 19th century, following the trends of the time. Public works, such as roads and harbors are built, public and private buildings embellish the city, education is reorganized, industry, especially tanning and tobacco industry, agriculture, trade and shipping flourish as well. After the destruction of the vineyards from a plant disease, tobacco cultivation developed and viniculture revived with the introduction of American vines. During the last period of the principality government, doctors, Greek literature teachers, lawyers, agronomists, architects, civil engineers and other scientists and scholars contribute to the cultural development of the place. Apart from the formal newspaper SAMOS, many others were printed, too (Evnomia, Patris, Phos, Proodos, Aegeon etc).